A few days after their state’s primary elections, Chinese-American community leaders in Maryland woke up to an email in their inboxes. It was from Lily Qi – director of special projects for the government of Montgomery County, an affluent suburb of Washington – thanking them for their support in the reelection campaign of County Executive Ike Leggett, whose primary victory cleared the way for a third term. “In a low turnout election like this one, every vote counts and the immigrant community holds great sway in tipping the balance,” Qi said in her note. Throughout the campaign, Qi had tirelessly reached out to the Chinese-American community, which accounts for 5 percent of county’s population of one million. 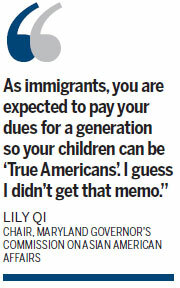 In her email, Qi, who also serves as chair of the Maryland Governor’s Commission on Asian American Affairs, announced the victories of two Chinese-American state legislators – one delegate and one senator as well. “We’re growing stronger as a community because of people like you who care about things bigger than yourself,” Qi signed off. The memo offers a glimpse into the wide spectrum of Qi’s professional and community service footprints and her own “caring about things bigger” than herself. As a political appointee responsible for high-priority initiatives related to the county’s economic competitiveness and global partnerships, Qi knows the reelection of the county executive ensures she can continue to do what she loves and excels at. Previously, Qi had been the vice president of Washington, DC Economic Partnership, overseeing the capital city’s business attraction and retention. Qi’s current grand projects include engineering a new comprehensive economic strategy for the county that integrates existing businesses, community and workforce development strategies and branding the county as a vibrant destination – rather than a backyard of DC – to attract younger generations, businesses and visitors. For Qi, community service has no less impact or meaning. Before becoming the state’s point person to the fast-growing Asian-American community, Qi had been the county executive’s liaison for Asian and Middle Eastern Americans and also served as president of the Organization of Chinese Americans’ Greater Washington, DC Chapter. Calling herself a “cultural broker”, Qi helps local communities and leaders understand the dynamics and opportunities of immigrant communities that now make up one third of the county’s population, while helping these new communities participate more fully in local affairs. “Being a cultural broker can be tiring,” said Qi, whose evenings and weekends are crammed with community meetings and events. Still, she tries to make herself available for various causes. Qi is often able to make her professional and community efforts complement each other, because both fulfill her passion for social causes, which was the main thing that led her into a public service career in the first place – she wanted to have a direct impact on policies that affect people’s lives. Recognizing the positive impact that a new Life Science Center in Montgomery County could have on growing the “innovation economy” and residents’ employment opportunities, Qi mobilized Asian communities to lobby county council members, who unanimously approved the plan, despite several members’ earlier opposition. No matter what cause Qi ends up advocating, her signature traits are confidence and the ability to lead. And Qi has been determined, from very early on, to lead as a true American. Instead of embarking on the kind of traditional and secure technical jobs that first-generation immigrants often take, Qi went after positions usually reserved for native-borns and often ended up being the only Asian in her work place. While serving as the assistant director for multicultural affairs at American University in the late 1990s while working on an MBA degree there, Qi also took it upon herself to learn about American racial cultures, including what it meant to be Asian American, which anchored her even better as an active member of American society, she said. “I have become an expert on the capital region’s Asian-American experience, not because I happen to be Chinese, but because I spend time reading, thinking, writing, and talking about these issues,” said Qi, who writes a column for Asian Fortune, an English-language newspaper targeting the Asian-American community of the greater DC area, and has become a unique voice as a frequent speaker and moderator on immigrant integration, Asian Americans, global/local economic competitiveness and their convergence. During last May’s Asian Pacific American Heritage Month, Qi was keynote speaker at a National Labor Relations Board celebration, as she has been for the FCC and several military installations in the past. As she does with any public presentation, Qi took the time to make sure her speech was “flawless”. “No matter what you do, you should do it the best you can because you are the brand,” said Qi, laughing at herself for being “a perfectionist”. This might explain how Qi, a non-native English speaker, when asked to teach a course in public speaking as a new graduate student at Ohio University in 1991, would overcome her fear and excel. This might also explain how Qi would later become spokeswoman for the Washington (DC) Department of Insurance, Securities and Banking, leading a team of native English speakers. Proudly standing at the intersection of politics, business and culture as a connector and influencer, Qi said she has reached a point in her life where job or career are secondary to her desire to wake up every day with a cause to work for, whatever her position may be. This entry was posted in career choices, civic involvement, economic development, life as an immigrant, personal development, Women and tagged civic involvement, community service, immigration, personal growth, social integration by Lily. Bookmark the permalink.